Big doings with Food Not Bombs in Greensboro! After our successful fund raiser last month we’re moving forward with plans to put in a kitchen at the HIVE. And Keith McHenry, co-founder of the Food Not Bombs movement, is coming to town–we’re having a potluck dinner for him at the HIVE. I wrote the following a couple of years ago for a great CrimethInc DIY compliation called Recipes for Disaster. It seems like a good time to reprint it here. The concept behind Food Not Bombs is so simple you could start one on your own even if you’d never seen one anywhere else; if there isn’t a Food Not Bombs in your town it’s time to start one. Food Not Bombs doesn’t simply feed people and redistribute resources–it is one of the most common and effective ways that people get their first taste of radical anarchist politics. You can’t look long at all those mounds of discarded food and all those people who could use a good free meal without beginning to question the basic principles of a society that values wasteful consumption over common sense. Food Not Bombs is the gateway drug to activism. There are a very few things you need to start a Food Not Bombs. ★A place and time to cook. ★A place and time to serve. There are also a few things you don’t need to start a Food Not Bombs. 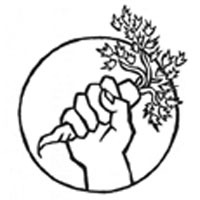 An understanding of and agreement with the three principles of Food Not Bombs: Although there is no central office or board of directors of Food Not Bombs, all the groups adhere to three basic principles–Consensus, Nonviolence, and Vegetarianism. Consensus is another way of saying non-hierarchical organizing, which is in itself a way of saying anarchism. Food Not Bombs is not a charity with “us” giving food to “them”; as an anarchist organization part of its purpose is to provide people the means to affect the things in their own lives that are most important to them, and to break through the barriers of class, race, gender, age, ethnicity and all the other artificial boundaries that keep people separated from one another. It is an opportunity for people to decide for themselves how much they want to be involved; the power in Food Not Bombs lies with the people who choose to use it, within the framework of consensus by the group. Food Not Bombs is a practical hands-on protest against the violence of poverty and hunger. An empty stomach is as painful as a punch in the stomach; chronic hunger is as damaging, both physically and psychologically, as a gun to the head. Poverty shortens lives, sends people into addictions, eats away at pride and self-reliance. Hunger destroys health, saps energy, takes up time. In some parts of the world–notably San Francisco where thousands of people have been arrested over the last decade for the simple act of serving food in Golden Gate Park–Food Not Bombs is met with violence and repression. The typical Food Not Bombs reaction is to simply keep serving, with back-up food if necessary. Food Not Bombs is based on direct action, not coercion; when it is met with coercion it takes action. Food Not Bombs meals are always vegetarian and often vegan. The reasons are several: the production of meat is an inherently violent process and therefore runs counter to the Food Not Bombs philosophy of nonviolence; vegetarian meals like the ones cooked at Food Not Bombs are healthier than meat-and-potato meals, and serve as a vivid demonstration that meat is not an essential ingredient; vegetarian meals are less expensive than meat-centered meals, so resources can be stretched further; and meals prepared without animal products are safer and less prone to spoiling. If you can agree to these principles you are ready to start your own Food Not Bombs. What else do you need? A place and time to cook. Food Not Bombs meals are cooked in all sorts of kitchens, from punk houses to churches to community centers to mobile propane ranges. A public kitchen in a church or community center is ideal if you have one available, not only because it is probably already outfitted with the institutional-sized pots and pans you will need for cooking in quantity, but because a wider variety of people may feel more comfortable cooking in a neutral setting than they would in a private home. Whatever kind of place you cook, make sure you choose a place that has some permanence (and, if it’s in a house, that all the house members agree to let Food Not Bombs use the kitchen); work hard to find a place that is accessible to people with disabilities. Allow a minimum of an hour and a half for cooking. A place and time to serve. This may take a little experimenting before you get it right. Start by finding out when and where other groups serve meals in your community so you are not duplicating efforts–one way to do that is to go eat at a local soup kitchen and simply ask the people eating there where else they eat and if they have any recommendations about when and where you should serve. In most communities Food Not Bombs serves outside and often in highly visible locations both to make the meals easy for people to find and to make the unavoidable point that hunger exists in America and that people can be fed. In addition to regular, consistent servings, Food Not Bombs groups often make themselves available to serve food at conferences, protests, and other special events. A core of volunteers. It takes surprisingly few people to put together an active, self-sustaining Food Not Bombs, but it may take a little while to get the right mix of volunteers. Put up flyers, talk to people, table at shows and events, rope in your friends to start, but keep working to make your volunteer group as diverse and committed as possible. This is important first of all because it is natural for any volunteer group to devolve into a small group of the same people who show up every week; if those people burn out or have trouble getting along with each other the whole organization can fall apart quickly. In communities where there are several Food Not Bombs servings volunteers often sort themselves out into affinity group-like teams of people with similar tastes and backgrounds. This is fine so long as all interested groups are represented somehow; some types of people may not have the means or the experience to form a group of their own. One of the nicest things that can happen is that the people serving and the people eating begin to overlap. I was telling a woman recently that we had several homeless men among our volunteers. “That’s good,” she said. “It means more to them if they have to work for it.” That statement simply doesn’t make sense in the Food Not Bombs context: there is no “they”–and cooking is too much fun to call work. It is nice, though, to make Food Not Bombs a welcoming place to people who are often made to feel that they don’t have anything to contribute–never forget to reach out, and always remember that an open door is not enough. Some people–not just homeless people, but older people, younger people, middle class people, your moms–may need extra encouragement to feel that they truly are welcome in the kitchen. Transportation. Transportation is an obvious ingredient–you’ll need at least one car or bicycle to pick up food and perhaps carry it to the location where you serve. Keep that is mind as you recruit volunteers, and make sure you’ve got back-ups. Basic large-size cooking pots and pans, a few staple ingredients, and serving containers and utensils. If the kitchen you are using doesn’t have big pots and pans you’ll need to get some. Basic cooking equipment includes a large soup pot, a large frying pan, some baking trays (disposable foil pans can be reused for quite awhile), big spoons for stirring and serving, and sharp knives. You can look in thrift shops, yard sales and dumpsters for cooking equipment, but don’t overlook restaurant supply places, which sometimes have back rooms where they sell damaged and second-hand equipment cheap. Staple ingredients include salt, pepper, spices, vinegar and oil (olive oil if you can afford it–olive oil makes just about anything taste better and you can stretch it by mixing it with cheaper canola oil). Serving containers can be anything from plates and bowls to recycled plastic tofu boxes; ask around for donations and you’ll be surprised how many people have dishes and pans to give away. Food. Believe me, the food is out there. Start by asking your local food coop, if you have one, to save its wilted and spotty vegetables and other expired goods for you. Go to bakeries at closing time and ask for the bread they are going to throw away (bakeries tend to bake much more than they can sell for some reason; in my town they often put the bags of leftover bread out by the back door rather than in the dumpster in hopes that someone can use it). A local steak house gives us their leftover baked potatoes at the end of the night, plus their prepped lettuce and tomatoes–talk to restaurants and caterers about what they might be willing to donate. If you still need more food, go dumpster diving: we have a standing Wednesday night date to go through three grocery store dumpsters to see what we can find, which yields us enough not only to serve 30 or 40 people the next day, but to put extra groceries out for people to take home. If you dumpster food, however, make sure that you are not stripping dumpsters other people depend on–we do our dumpstering in a suburban neighborhood where we are not competing with anyone. Highly developed cooking skills. It helps to have at least one volunteer with some cooking experience, but cooking really isn’t all that hard. Money. Most of your food will come to you for nothing–that’s part of the point. You may, however, need some start-up money for pots and other equipment, and you’ll need to spend money occasionally on oil, rice, etc. Don’t turn down donations–you can put out a jar if you like (we prefer not to do it at regular servings because we don’t want anyone to feel bad about not making a donation, but a donation jar at a special event is fine). Other ways to raise money include benefit shows, yard sales of dumpstered items, and selling patches or other things. Don’t let lack of money keep you from starting a group–it will work out much more easily than you might think. Permission. The only permission you need is the consensus of the group–you don’t need approval from a central office or anyone else to get started. Some people worry about the legal liability of giving away free food; you can explain to them that your activities are covered by the “Bill Emerson Good Samaritan Food Act”, a federal law protecting people who give away food from lawsuits (to see it for yourself check http://www.house.gov/combest/donor.htm). If you feel that you need a permit from your city to set up a serving in a park or other location by all means look into it, but most groups don’t bother–in fact, one of the underlying points of Food Not Bombs is that no one should have to ask permission to serve food to people who want it. For legal tips and lots of other helpful information check http://www.foodnotbombs.net. ★Just about anything can be soup. Saute onions and garlic in oil, add water (enough to fill up your pot about 3/4 of the way), drop in chopped vegetables, bring to a boil and lower the heat to a simmer. Add spices and herbs to taste. For a thicker soup put in a handful of rice, some pasta, some lentils, or some diced potatoes. Takes about 45 minutes. ★Stir fry is basically like soup without the water. Follow the directions above, using a big frying pan instead of a pot. Serve with rice or other grains. Takes about 45 minutes. ★Cut up any kind of greens (anything except lettuce) using everything but the stems, and put them in a frying pan or pot with a little oil to prevent sticking. Add a very little water–the greens will give out their own moisture as they cook. Add a little vinegar to taste and season with salt, pepper and nutmeg if you’ve got it. Fill the pot as full as you can and keep turning the greens as they cook–they will shrink dramatically. Keep adding greens, stirring and turning occasionally. Turn off the heat before the greens are completely limp and colorless and cover the pot until you are ready to serve. Takes about 30 minutes. ★Cut potatoes (you can use sweet potatoes as well as regular potatoes) into rough squares; no need to peel them unless the skins are really dirty, but wash them first if you are leaving the skins on. Drop the potatoes in salted water and boil until they are soft when you poke them with a knife. Drain the pot and mash the potatoes. Add margarine if you have it or oil if you don’t; moisten with soy milk or some of the cooking liquid from stir fry (liquid from greens is too bitter for mashed potatoes). Add salt and pepper to taste; parsley and garlic are good too. Takes about 1/2 an hour, more if you’ve got a lot of potatoes.